Perhaps one of the most famous people of Japan, and whom foreigners always think of when they think about Japan, are the samurai. Although clearly they no longer exist today in the same way that people think of them, i.e. men with topknots wearing traditional Japanese clothes cutting down anyone who challenges them, they still pervade Japanese culture. In castles and museums armour hundreds of years old can be seen, some old and wealthy families still even have either swords or armour from their ancestors, and even in places as far as London you can see samurai armour that was given to the English king by the shogun of Japan in the seventeenth century. One indication of how heavily the image of samurai sits in the mind of foreigners can be seen in a recent movie The Wolverine where the antagonist of the story survives through the use of a giant robot, for no obvious reason the robot looks like a samurai warrior. 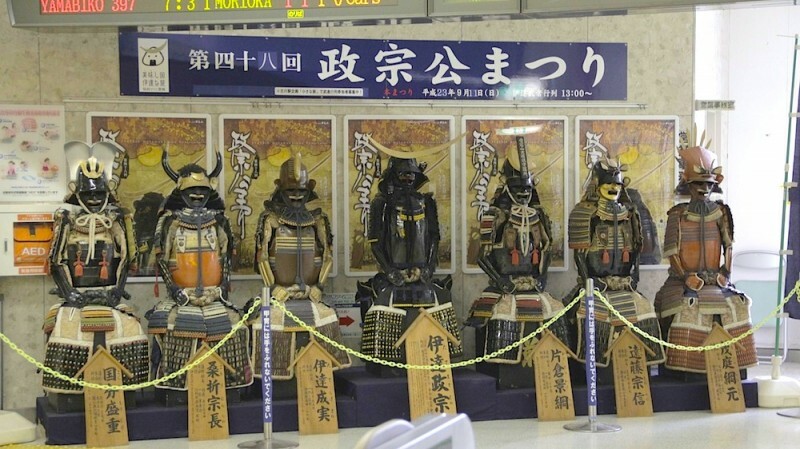 Sometimes Japanese people travelling abroad will get asked ‘are you a samurai?’ or even ‘are you a ninja?’ and people who travel to Japan like to take the opportunity to dress as a samurai if possible. However, despite this strong association with Japan they were in fact only present in this country from around the 11th century, originally as a kind of mixed police/army force. Towards the end of the 12th century their influence had grown enough that they had started to form powerful clans and to rule the country. After the Heiji rebellion of 1160 the samurai took over the government and from this period onwards started to become the warrior nobility of Japan while the emperor’s position became increasingly powerless. The integration of the samurai class into nobility meant that they began to take up more aristocratic hobbies such as calligraphy while court nobles began to take up more warrior-like ideals. With the spread of Buddhism in the 13th century some of the more traditional traits of the samurai were developed, such as a lack of fear of death, while the failed Mongol invasions of the same century which were more than partly due to poor weather, added to the samurai’s belief in their strength and the power of their country. Some of the most famous examples of samurai lords are Oda Nobunaga, Toyotomi Hideyoshi and Tokugawa Ieyasu whose combined efforts led to the unification of Japan, and it was in fact Hideyoshi who made into law that the samurai were permanent and that this status could be inherited by their children. In addition only the samurai were allowed to carry weapons, however with the country closed to the outside world and largely united the following centuries saw the reduction of the samurai warrior and the creation of a more samurai administrator or courtier. The beginning of the end of the samurai started when the country was forced open by American Commodore Matthew Perry and his US navy steamships, within 15 years the Meji Restoration put the emperor back in power and soon after he abolished the samurai’s right to carry weapons, the right to wear a katana and also the right to execute anyone who showed them disrespect. When we think of samurai we normally have an image of devil like armour and a sharp curved sword, or in fact two swords as many would carry both a long sword, or katana, and a short sword, or wakizashi. Another weapon which is sometimes associated with the samurai is the longbow, in moves like The Last Samurai and Thirteen Assassins you will see both warriors and noble lords showing proficiency in archery. Generally the weapons which people find hardest to associate with the samurai are muskets and cannon, however from the sixteenth century these were both weapons which they used especially in defence or attack of a castle. Despite this it seems that the image of a warrior, in a kimono or armour, with a sword (or two) is firmly embedded in everyone’s mind. The armour itself, even when seen today just in a museum, provide a very interesting sight and it is easy to see how they were designed to bring fear to their enemies. Some of the first types of armour were known as yoroi and involved small scales of leather or iron bound together in strips which were then laced together, later Japanese armour used iron plates. It is very typical to view it as one piece of armour with a helmet, but in fact it was no easy feat for a samurai to put on full armour. First of all he would need to put on underclothes, such as gaiters which covered the shins, pants, a shirt, gloves and leather shoes or boots, then the actual armour itself could consist of up to 19 separate items including the cuirass, greaves, gauntlets, neck guard, crest and faceplate. In addition a samurai warrior might have a small banner attached to the back of the armour, identification badges or an arrow quiver. Today there are no more samurai, but in places like castles sometimes there is the opportunity to dress up like a samurai. In addition in recently samurai squads have started to be formed to entertain visitors to some of these castles, wearing armour and traditional weapons they tell stories and perform sword fights. Some of these warriors like to dress up like historical figures and tell everyone the tales of their lives before engaging in fierce combat with their rivals of old.